Logan 301-1 Compact Classic Mat Cutter 32"
The Logan 301-1 Compact Classic Mount Board Cutter is versatile, portable 32" (81cm) capacity cutter which will provide affordable and professional results at home, in workshops, studios and camera clubs and great for beginners or those how would like to add a mount to existing pictures or updated the ones you already have. The Logan Compact Classic 301-1 is the entry model of Logans board mounted mat cutters. It offers exceptional value for money and is an ideal upgrade for those seeking the benefits of cutting with a parallel mat guide (borders can be set from 3/4" to 4.5") on a fixed board. The open ended guide rail allows bevel cuts in mount board of any size. The cutter includes a parallel mat guide for setting border widths from 3/4" (1.9 cm) to 4-1/2" (11.4 cm), a spring loaded serrated guide rail for cutting heads, push style bevel cutting head with start and stop indicator, a mat knife for downsizing mountboard and foam board. The built-in carry handle in box makes it ideal to use while on the go and stores away while not in use. 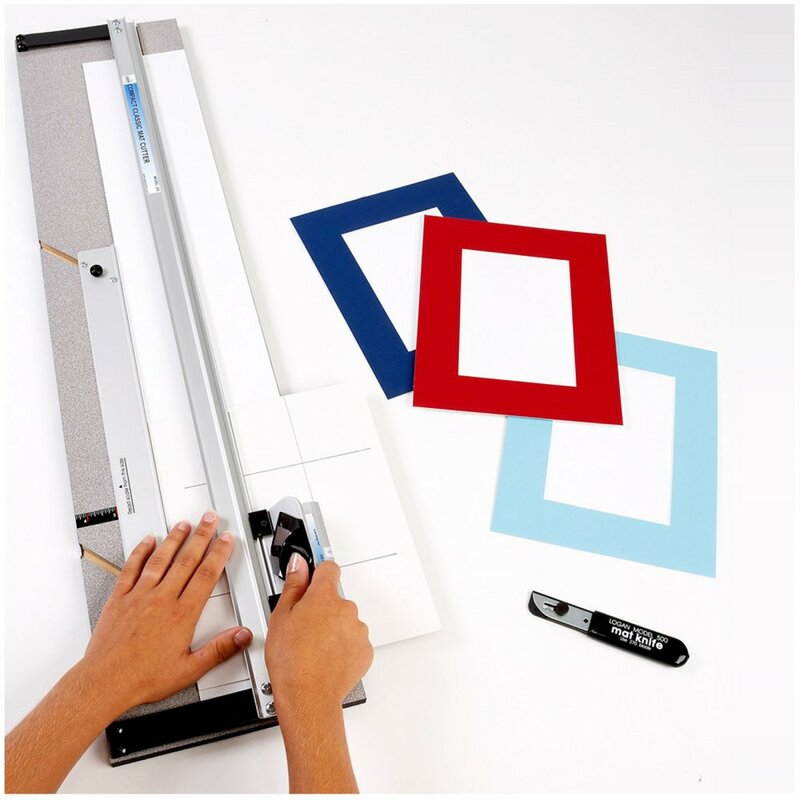 The mount board cutter comes with five extra 270 blades, a free instructional DVD and a full illustrated instruction guide. Showing 3 of our total 4 reviews, with an average rating of 5 stars. Read all 4 reviews for Logan Compact Classic Mat Cutter 301-1. I have tried the cheaper product (Jakar) which I did not get on with at all and had to take it back. The Logan, much more expensive, was so many classes above. It is easy to use and robust in construction. This should last me for years to come. Very happy with it indeed. My Logan board cutter is a top piece of kit. Very easy to use and instant professional-standard mount-boards are soon produced pretty quickly. CraftyArts were excellent to deal with - just used the website and the kit arrived soon afterwards. I was so excited waiting for my Logan cutter to arrive... I made a couple of projects in the first couple of days. I have many more waiting to be made. When I'm next in the area I shall visit the store, I'm sure there are other things I 'need'.